When you are searching for a reliable web hosting service, you will come across many review sites in the Internet. You can read about the different recommendations posted by people in those review sites. Many people tell you which are the best web hosting companies available in the market. However, many people may not provide you with the actual fact because they may not have personally tried the hosting service that they recommend. Frankly speaking, most of the hosting services are technically the same. Hosting companies come up with these â€œfancyâ€ packages that bundle with all kind of features to confuse the consumers. Whichever package you choose to sign up, you will still get the same value for money hosting features in most of the hosting companies you can find. So, what is the most important thing you need to take into consideration before you decide to sign up for a hosting account? Technical Support. They Are Your Emergency Rescue Team! A good hosting company should put its priority in providing a technical support team with fast response time. It is the key towards providing a high quality service to the customers. I can say that, 95% of the time you will not need to get any support assistance from your hosting company. When you need to ask for help, it will be a â€œlifesaverâ€ to have the support staff responding to you in shortest period of time to help you solve the technical problems during emergency. I believe most people, including you may not be a technical person. You will still be able to administrate your hosting account without much hassle with the administration tools that comes with your hosting account and online guide that answers to some of the most common questions. Most hosting companies that I signed up before were poor in technical support. These hosting companiesâ€™ web sites were boasting about how superb was their customer service and technical support. But in actual fact, the support team either lack of knowledge in solving the problems or they responded to my e-mails late. Some hosting companies do not provide technical support after office hours. I felt frustrated when I needed help but no one was able to assist me to solve the problem. By the time it was fixed, Iâ€™ve already lost many visitors to my web site. Ever since I signed up for HostMonster, I have stopped searching for other hosting companies anymore. I was totally amazed with the high quality of support I could get from them. They showed their professional courteous support when attended to me. HostMonster offers 24×7 toll-free telephone support. It has a Live Support feature that I use quite often to get help on urgent matters. This feature benefits International customers by saving on International phone call charges. I use the Support Ticket System when I need help. I can also track the ticket history with the system. Most of the questions I sent to them were responded within 30 minutes. Recently, I received e-mails from the support staff mentioning that they would be performing some proactive maintenance to enhance the server performance. So far, the server hosting my account is performing very well. This shows that they do take care of their customer interest seriously by making sure all the servers are functioning well with 99.9% uptime guaranteed. HostMonster won many awards for its high quality service. One of the awards was the Best Customer Service 2006 awarded by Hosting Review. 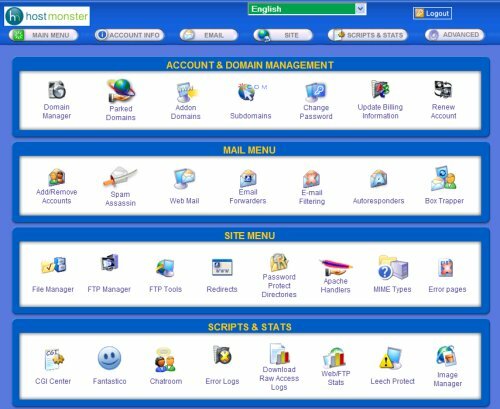 All HostMonster accounts include Cpanel that makes your life much easier to administrate your hosting account. Some of the features you can perform in Cpanel are add, upgrade and delete domain names and e-mail accounts, MySQL database, and backup all the files in your hosting account. Cpanel also allows you to install, upgrade and delete some popular applications, such as WordPress and osCommerce shopping cart. With the single-click installation feature, just sit back and let Cpanel does the rest of the work for you. Here is a screen shot of the Cpanel administration interface. HostMonster offers you a Shared Hosting package. You can host unlimited domain names all in the same Hosmonster account. That means you do not need to spend extra money to get extra hosting accounts to host your other web sites. Your account will be setup within one hour of your purchase. You will receive your account information via e-mail. It is just two steps to sign-up for a HostMonster account. You will be asked whether you want to register for a free domain name. If you have one already, you can just enter your existing domain name.